HISTORY adds a boost of adrenaline to your Sunday nights with its brand new series, "IRT: Deadliest Roads" at 10/9c (new episodes following the premiere will air on Sundays at 9/8c). 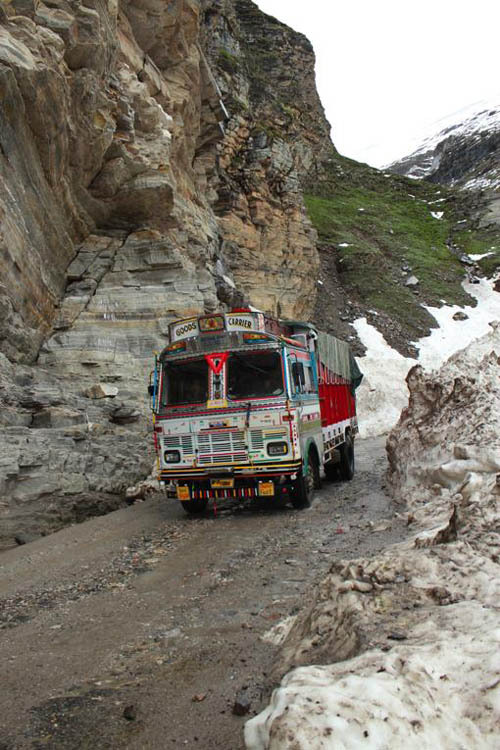 Set in the highest and most dangerous mountain ranges in the world, the Himalayas, three seasoned truckers will be forced to drive through the deadliest and most unpredictable routes that the road has to offer. Follow drivers Lisa Kelly, Rick Yemm and Alex Debogorski as they deliver goods to small villages along untouched highways. Visit the official "IRT: Deadliest Roads" website for photos, videos and episode guides and become a fan on Facebook. TO ENTER: To enter the "IRT: Deadliest Roads" contest (aka IRT), entrants must begin following Joshua Maloni on Twitter or add Joshua Maloni as a friend on Facebook during the "CONTEST DATES" period indicated below. Upon verification of participation, said entrant will register to win the grand prize. LIMIT ONE ENTRY PER PERSON PER TWITTER AND FACEBOOK ACCOUNTS. GRAND PRIZE: One (1) Prize Pack. One (1) winner will be selected by random draw and notified by e-mail on Monday, October 18, 2010. Prize Pack will be mailed to address provided by winner. CONTEST DATES: Contest runs from 12:30 p.m. (EST) Monday, October 4, 2010, through 11:59 p.m. (EST) Friday, October 15, 2010, and is open to U.S. residents only. Employees of NFP and their immediate families are not eligible to enter this contest. UNCLAIMED PRIZE: In the event any prize is not claimed or is forfeited, a second entrant will be selected. RELEASE AND DISCLAIMER: By enterting this contest (aka submitting the aformentioned entry requirements), all entrants agree to hold harmless and release Niagara Frontier Publications, Grand Island Publishing Corporation, its newspapers, Web site, affiliates, subsidiaries, shareholders, directors, officers, employees, the service agencies and independent contractors of any of the above and all others associated with the development and execution of this contest from any and all liability with respect to or in any way arising from this contest. NO PURCHASE NECESSARY TO ENTER, VOTE OR WIN. A PURCHASE DOES NOT INCREASE YOUR CHANCE OF WINNING. RESTRICTIONS APPLY. BY PARTICIPATING, YOU AGREE TO BE BOUND BY THESE RULES. IF YOU DO NOT AGREE WITH THESE RULES, DO NOT ENTER THIS CONTEST.